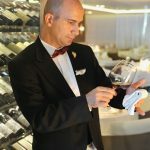 PONANT, the only French cruise ship owner, offers a subtle combination of gastronomy and oenology with its “Gastronomy, Vineyards and Grands Crus” cruise. An epicurean adventure to be enjoyed from 13th April 2019. With this cruise in partnership with Ducasse Conseil and Château Latour, PONANT offers the chance to enjoy an extraordinary culinary experience, a journey incorporating visits to exceptional vineyards and cities along the Atlantic coast with a rich cultural heritage. Pursuing the collaboration between PONANT and Ducasse Conseil, the consulting experts of Ducasse Paris, guests will partake of two very special gala dinners prepared by Xavier Boireau, chef of the Rech restaurant, a seafood institution in Paris, and Francis Fauvel of Ducasse sur Seine, the first 100% electric cruise boat restaurant. To round off this experience, the master cheesemonger, Bernard Antony, will be present aboard, offering a selection of exceptional mature cheeses. This gourmet journey will also be the occasion to meet the geographer and wine historian, Jean-Robert Pitte and the famous sommelier, Eric Beaumard. They will both give fascinating lectures throughout the cruise on oenology and French winemaking history. On land, this cruise also offers a selection of unique oenological discoveries. After visiting Porto (Portugal), notably to tour the cellars of Taylor’s, one of the most prestigious Port wine producers in the city, located on the shores of the Douro, L’Austral will raise her anchor and chart a course for Saint-Jean-de-Luz (France), to discover the Basque Country, before sailing up the Gironde estuary to call at Pauillac (France). This is the gateway to the beautiful chateaux of the Saint-Estèphe, Margaux and Pauillac wine-making appellations, which will open their doors for a series of visits and wine tastings. At nightfall, the ship will be moored opposite Château Latour and guests will be offered an exceptional gala dinner where each wine has been chosen to accompany the dishes. 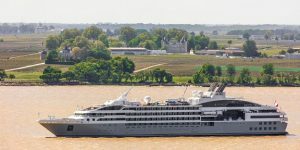 A two-day port of call in Bordeaux, the global capital of wine, will allow guests to truly appreciate the rich winemaking tradition of this region.